Breathing a huge sigh of satisfaction and relief. I've just put the bats back to bed. I've been feeding a big brown bat named Ambrose every night for the last two weeks. He was found by an Instagram pal of mine in a bathroom sink. 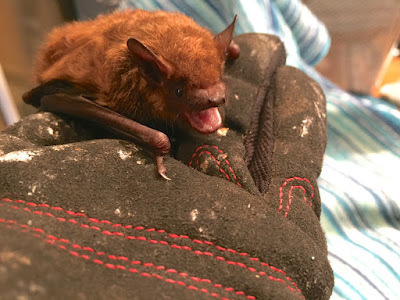 Because of the weird and delicate web of Instagram, Leah knew I work with bats, knew to call on someone who'd know what to do for this wee foundling. Bats that are found in heated homes in winter are in trouble, usually because their normal hibernacula (rhymes with Dracula!) have become too cold. 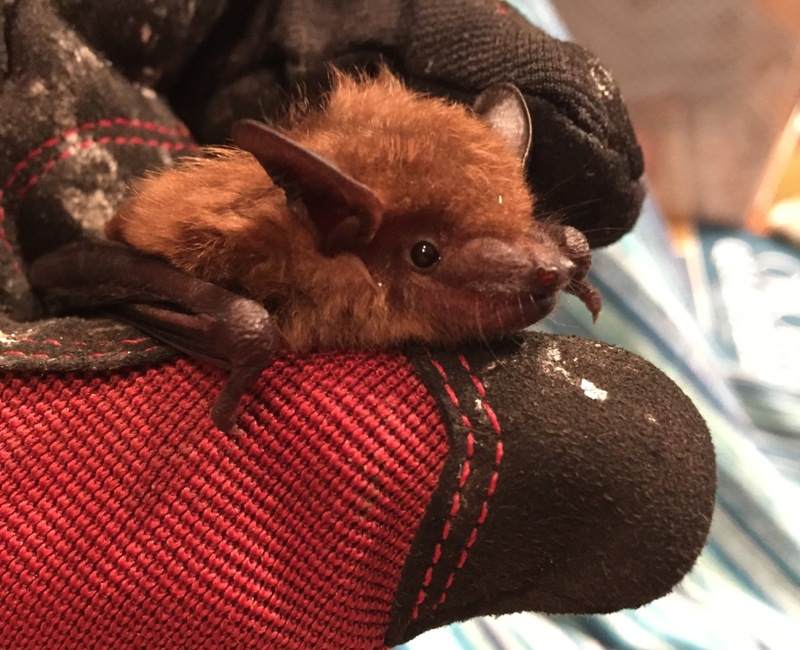 People's pleas for help with bats they've found tend to come in when the Polar Express sweeps down from the Arctic with bitter temperatures. 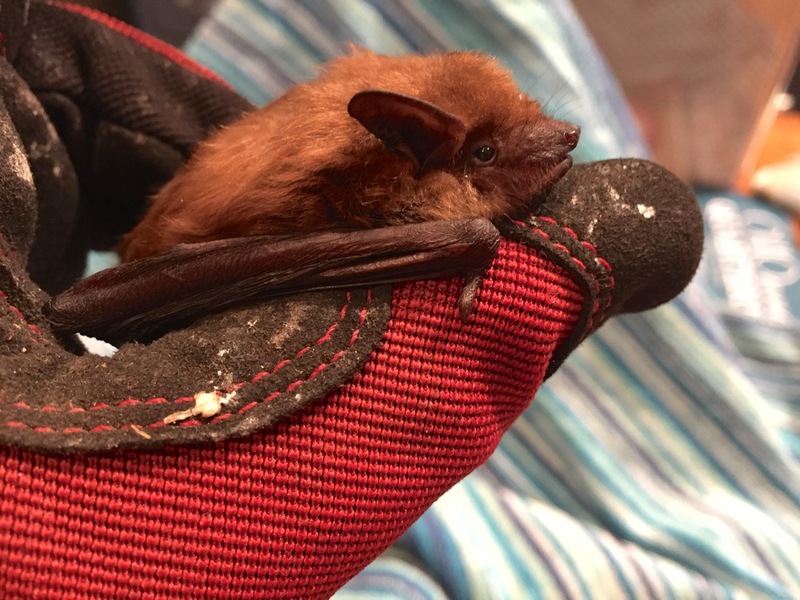 Bats that find themselves freezing to death, I surmise, somehow make their way from attics and sofits down into to warmer places, and that brings them into contact with people. That doesn't usually go well for the bat, unless someone like Leah is in the mix. 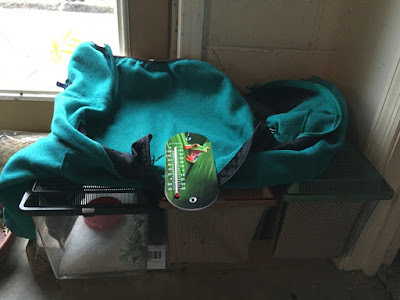 She picked the little bat up with a hand towel, placed him in a box and taped it up securely. 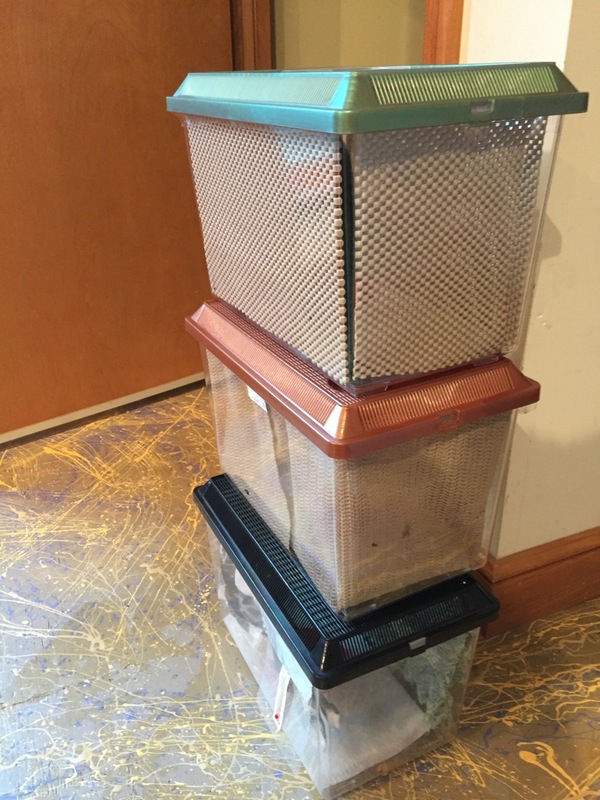 We met at a pet shop in town, where I was going to buy my third critter keeper so I could accommodate the new arrival (I've already got two bats in care). Ambrose (named for one of Leah's adorable sons) came in weighing only ten grams. That's dangerously low for a big brown bat (low normal weight is 17 gm). They get as heavy as 22 gm., but after that, they're too fat to fly. I knew I had my hands full with this little guy. He was a lousy, reluctant eater, dehydrated and down. I sometimes had to coax him for ten minutes or more to take his first mealworm. Once he started eating, he'd down 7 or more at a go. I doggedly kept at it, and after two weeks, he was the bright-eyed, active little sprite you see in this video, weighing in at 16 gm. ( I weigh the bats before each feeding). I figured that was close enough to normal, and with a great sigh of relief, readied him for hibernation with a final big feeding. Because we had three nights in a row in the 50's, I decided to wake up the other two bats, Lyle and Murcie, for a midwinter feeding. I let them sleep until nights get warm enough that, were they in the wild, they might go out looking for moths. So for three nights, I was feeding all three of them, and that took well over an hour each evening. I couldn't wait for it to get cold again so I could put them back to bed. 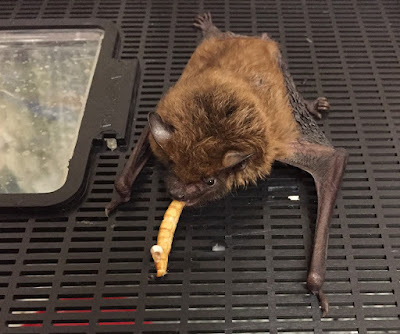 By about 8 pm, I'm fried, and bats eat best after 9, I've found, so it was a struggle for me to stay up late enough to get them all taken care of. I love this little unexpected flitter Ambrose executes, onto an old license plate in my bat room. This is Lyle. He's also a refugee from a house. And here's Murcie, the biggest and strongest of the three. Also the most opinionated. 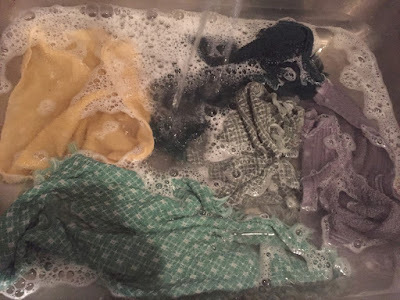 What's involved in putting them back to sleep for a few weeks is cleaning their boxes and taking out their soiled linens (they sleep in hand towels, folded over and taped to the top of the boxes). I replace the paper toweling on the floor and put fresh clean linens in. You see that the boxes are lined with nonskid drawer liner, extra thick. This is so they don't break their delicate finger bones on the plastic sides of the box, beating their wings. Washing bat linens. It's pretty disgusting. Not going in my washing machine, nossir. I keep the condos by a poorly-insulated door in the basement. 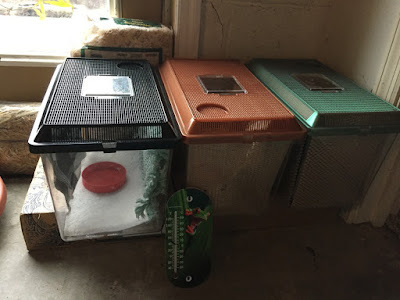 It gets pretty darn cold down there on the floor, so I put the critter keepers up on a box. I also cover their condos so they aren't drafty. The all-important thermometer gets checked frequently. It shouldn't drop below freezing. Ideally you keep them between 37-50 for torpor. I've learned to adjust the temperature by moving them closer to, or farther away, from the cold outside door. And there they sleep, for three to four weeks at a time, until the next natural warmup comes. Then I'll wake them, weigh them and feed them for a couple of nights. I've little doubt my bats eat more in winter than wild bats do, but I feel a responsibility to keep them in tip top condition, and I worry about them getting dehydrated, too. In order to qualify as a bat caretaker, I had to take a course in handling rabies vector species from the wonderful Barbara Ray of the Ohio Wildlife Center, and I've had two rabies inoculations--you have to provide proof that you've had the course and the shots before you can get a permit to keep bats. It is not for everyone, that's for sure. There is so very much to know about them, and they're teaching me more every single day. They are my best teachers. I feel I'm getting better and better at handling, housing and understanding bats. I'm very fortunate to have a cold basement where they can be safely overwintered. I shudder at the thought of keeping them warm and having to feed them all winter long, especially with all I've got on my plate now. I've done that and it's a ton of work. More importantly, I think it's bad for the bats to be kept warm in winter. There's a considerable risk of overfeeding them and making them too fat to fly. I know, because I've done that. Sometimes I think learning is just doing everything wrong until you figure out how to do it better, how to do it right. Here's a post about my fat bats. I don't overfeed my bats any more. I keep them lean and sweet. Lyle again. I find working with bats very rewarding, because gentle handling usually results in a tractable bat. They may start out terrified and chittering, but you can win them over with time, food and gentle hands. I've only had one bat (Drusilla) who came in horrid and remained horrid. I laugh just remembering her chewing away on my (double) glove. I loved her anyway. These three are total sweethearts by comparison. Bats, for me, combine all the things that are most wonderful about birds and mammals. They're delicate and very beautiful, and they employ flapping flight like birds do. Yet they're possessed of the softest fur imaginable, and the most winsome faces, like very small puppies. What a combo! Add to that the ability to survive for months without food or water, and you have a very special animal indeed. Miracles, they are. Just miracles. And they help me every bit as much as I help them. Priceless – to us, because you're paying the cost. Thank-you!!! Could you just keep them in a fridge for stable temps? Great reading. I had no idea people did things like this. Very interesting. I think some people do that, yes. Maybe it’s my incipient claustrophobia that rules that out for me. Or the fact that I’d have to buy a third fridge and dedicate it to bats. :D great question though! We don't often see bats so imagine our surprise when out birding on an unusually warm January day we saw a red (?) bat flitting across a field near a pine grove. An amazing sighting. I have no idea what kind of bat it was but it looked to be a very rufous coloring and a good size. Of course anything flying looks larger than it appears when roosting. 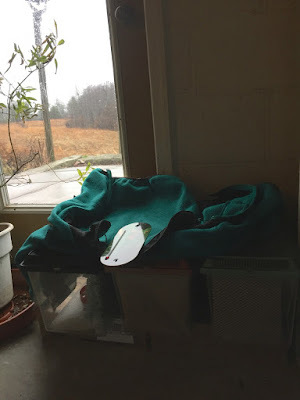 Love reading about your wildlife caring. being a part of saving him. We live in central GA but still gets very cold in winter. @Lisa Greenbow, it was probably a red bat. They are very heavily furred (even have a furry uropatagium that they use as a blanket!) Yes, I"m making people look that one up. They roost out in the open in winter, hanging like a dead leaf by one foot off a branch. And they forage on warm witner days. Dance flies are a favorite. Just about my favorite bat. @Pat Kinser, fabulous! Reds often roost on the ground in dead leaves and may get raked up and bagged--terrible. Don't know about hoaries but wouldn't be surprised as they are the same genus I believe. Two comments: I dutifully looked up " uropatagium." As a former English prof, I don't often encounter an unknown word. Maybe that's one of the reasons I so enjoy reading your posts. Second, in the first video--here's the thought that crossed my mind. Fascinating as the video is from your perspective and the bat's perspective, I can just imagine the mealworm says--"holy sh*t, I am about to become bat sh*t."
You have made me fall in love with bats over the years. Such beautiful, furry little wild creatures. I love how you care for them. Thank you for all you do, Julie. Good therapy indeed for all of you. Love these critters! I'm always astonished by how frickin tiny they really are! Then to think of the sheer numbers of them and the tonnage of insects they consume as a whole! Just so much tiny ferocity! And cute as little buttons! I just love these rehab posts you do, and thank you so much for the videos you take the time to make -- they are amazing! I grew up in an old house with an attic, across the street from a large church. Lots of bats came down into our bedrooms. This was in the 1960's. Many elderly folk lived with us and were scared to death. Fear of bats was rampant, and I'm sorry to say we killed them. (My big brothers did; I was too scared) Education saved me, and now I appreciate them. Love to hear of the good work you are doing, Julie.